FIREWALL is an outdoor environmental installation -- a memorial to the Firefighters & EMS personell of this 9 - county region around Centerville/Dayton, OH. 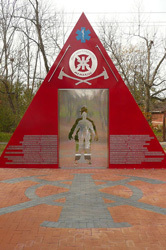 It is installed in Stubbs Park on Spring Valley Rd., near the amphatheatre. The first memorial service took place on 31.X.10. The Wall includes the names of 69 fallen heroes. The "firewalls" are steel construction, powder-coated. The largest is 15 feet high. The triangular precinct is paved in brick, 40 feet on a side. The entry pathway is paved with bricks from a 19th century firestation in Dayton. The Firefighter sillhouette idea was inspired by an ancient Jain icon of the Buddha -- the image being empty space, indicating the spiritual, immaterial essence of the Buddha, and hence, the Fallen. The standing sillhouette in the distance behind is the spirit of the Fallen in another dimension.